Different types of spray foam are used for sealing and insulation work, but one-part spray foam is the best-known member of this insulation family. That’s because of the popular pressurized cans of spray foam, such as GREAT STUFF®, that are available at hardware stores and home centers everywhere. Most brands of "canned" spray foam are closed-cell formulations. This type of foam forms an air barrier as well as a moisture barrier. The foam expands as it’s applied, filling gaps and cracks and sticking to the surfaces it contacts. The foam stays super-sticky for a few minutes (don’t touch it unless you have protective gloves on), then cures to a hard but flexible consistency. One-part spray foam comes in different formulations, based on how much the foam expands after application. High-expanding foam is used to fill large gaps, like holes made in framing for wiring and plumbing lines. 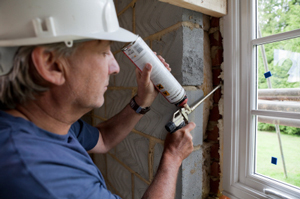 Low-expanding foam is used to seal gaps in framing around windows and doors, and to seal other smaller cracks. Spray foam is an excellent weapon in the battle against air leakage and inadequate insulation. But it’s important to use the right type of spray foam. For example, using a high-expanding foam in the wrong application can cause windows and doors to be inoperable. Fire safety codes require special spray foam to be used in certain applications. Full-service insulation contractors are trained to match the right spray foam to a specific application, ensuring code compliance and proper performance. Contractors also have access to special applicators that provide pinpoint accuracy when using one-part foam.